A few days ago, I mentioned that I would be posting about my summer pen pals. 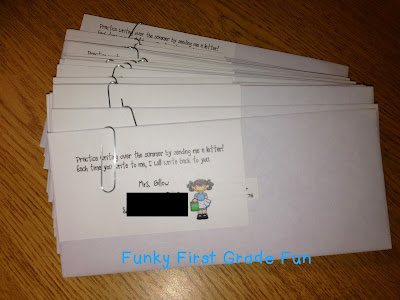 At the end of each school year, I give each student an envelope and invite them to be my pen pal over the summer. The envelope is for their first letter to me. I put a label on it with my address and attach a little note to explain this writing opportunity to their parents. Last summer, I received 27 letters from my students. Not every student wrote to me, but many of the ones who wrote sent more than one letter over the summer. I promise the children that I will write back to them each time they write to me (and I send stickers for them with every letter). Some children use a letter writing form that I included in their summer packet. We just finished school on June 7. So far, I've received 5 letters from my class. This one made me cry...so sweet! Emma moved to our school (from another state) on my birthday. We immediately decided she was my "birthday present" and what an amazing little birthday present she turned out to be! I miss seeing her face each morning too. I am enjoying these summer days though. I woke up early and went for a quiet run (hooray for me). Then my family started the day at our swim club with trampoline lessons for both kids and swimming lessons for our little guy. Then we had a picnic and I took a nap. Then it was off to dance class for my daughter. This evening, we squeezed in a family bike ride and a long dog walk. The weather is beautiful here this week. I am so grateful for this time to be with my family. Life is good! I do the same thing with my kids. It's always fun to hear from them. 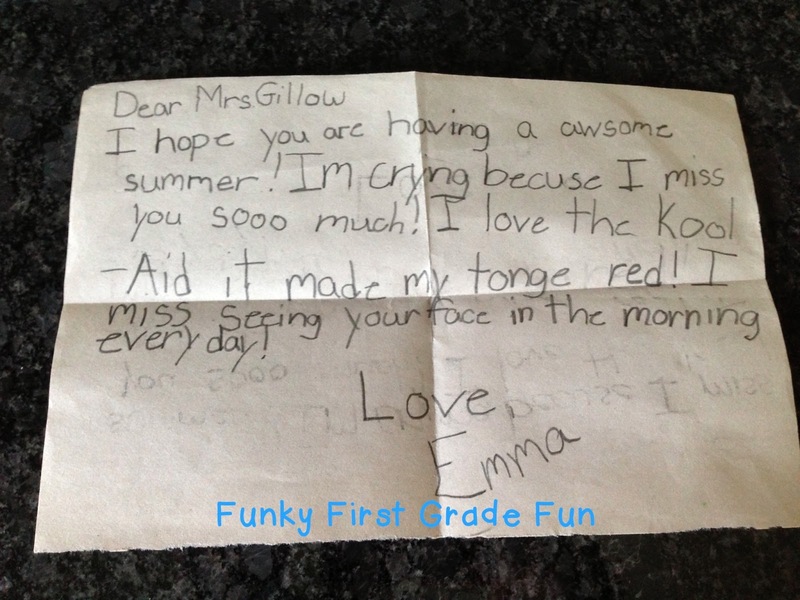 Emma's letter is adorable. This is a great idea! Must be fun to get these in the mail and see what the kiddos have to say! This is so adorable!! Definitely something I will keep in mind for next summer! !